People who watched a preview screening of "North Country" Friday night gave the movie an enthusiastic thumbs up. About 500 people were invited. Most were extras and others who helped when the movie was shot on the Iron Range last winter. 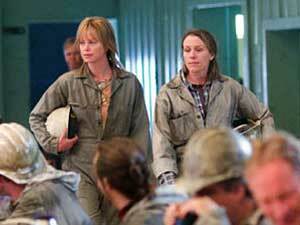 The movie is about women who fought sexual harassment in the iron ore mines in the 1970s and '80s. Eveleth, Minn. — Some people on the Range have been concerned that the movie might portray the area as backward or hostile toward women. But many who watched the film said it was fair and positive. When women started working in the mines, a few of their male coworkers made their lives miserable -- verbally abusing the women; poking, grabbing, threatening and assaulting them. Joan Hunholz is one of the 21 women who fought the harassment in court. They won the first class-action sexual harassment lawsuit. She says she was thrilled to play a small part in the movie -- one of the women who stands up in the courtroom to help make the case a class-action. "That really felt good," Hunholz says. "We were very happy that they allowed us to do that, and it feels like closure. That's what I was hoping for, and that's what I feel I got out of this movie is closure." The woman who started the lawsuit, Lois Jenson, says the movie is better than the book it's based on. She says the movie does a better job helping people understand what she and other women went through. "And plus it's softened by humor once in awhile -- which you need, when you have this serious stuff going on," Jenson says. "And then you have the music, and the scenery's beautiful. And you have Charlize Theron and Woody Harelson, and that's a whole lot more fun that what we went through! So it's terrific." Director Niki Caro came to the Range to celebrate with the people who helped her make the movie. She says the film is about the right to work with dignity, which is not a women's right but a human right. "These Iron Range women spent 20 hard years of their lives trying to make the world understand that," Caro says. "The film celebrates that work, and celebrates the change." After the showing, some people came out of the theater wiping their eyes. Others were thinking hard about what they saw. Archie Tisdell worked in the mines. He was an extra in the movie. "I felt bad the way they treated the women in that movie," Tisdell says. "I worked in the mines at that time, but I didn't know that was going on, no." Tisdell says his work on the film will give his grandchildren something to talk about. Dennis Jerrold of Mountain Iron says "North Country" is a good movie, and portrays the Range realistically. "It's not always been the friendliest place in the world up here," Jerrold says. "So I think she captured the essence of the story without making northern Minnesota look like something like Frances McDormand's movie, 'Fargo.'" Another response to the movie comes from a staffer at the Minnesota Film Board. Nicole Erdmann is from Minneapolis, but she lived on the Range for four months while the movie was being shot. She says Hollywood is bound to gloss over some of the most painful parts of the story, but she says Niki Caro managed to get the important points across. "I think it's a really great piece that people will watch, and hear the issues in a way that doesn't necessary make people defensive right off the bat," Erdmann says. "I think my dad would sit through it, and for my dad to sit through a movie about sexual harassment, I think, says it's a good job." Part of the movie was shot in New Mexico, a state that offers generous financial incentives to filmmakers. Former Gov. Jesse Ventura eliminated Minnesota's tax break for filmmakers after the state's budget crisis in 2001. State Rep. Tony Sertich was one of a delegation of Iron Range lawmakers attending the special screening of "North Country." He says he's hoping that incentive can be brought back. "Maybe folks will see now the clean money that's really made here," Sertich says. "It's a very clean industry; they come in, they spend money, and they leave town. And I think that'd be good for the region. I'm always looking for ways to bring in business, bring money to our economy, so hopefully we can look at it again with this success." "North Country" opens nationwide Oct. 21.